Impact Damage Insurance Claim? Need a reliable builder? Making an impact damage insurance claim? IC Assist can help. Impact damage claims are more common than you might think. Careless driving and road traffic accidents happen quite regularly. 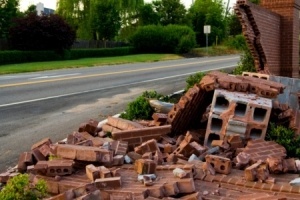 Often this results in vehicles knocking down boundary walls and occasionally can collide with buildings. If your boundary wall is damaged and you share it with your adjoining neighbour, the law requires that you serve them a Party Wall Notice (as per Party Wall Act 1996). It is crucial it’s done correctly. As you’re unable to start any repairs until your neighbour consents to the proposed work. Don’t worry – we can instruct a Party Wall Surveyor to ensure you comply. If a vehicle has hit your building, you may experience problems opening / closing windows and doors and will need your property secured straight away. More importantly, the impact may also have affected the structural stability of your property. Where necessary, we arrange for a qualified Structural Engineer to assess the damage. This will protect the safety of you and your family and give you complete peace of mind. (This is a cost that some insurance companies and Loss Adjusters don’t factor into their settlement offer). If a vehicle has hit your building don’t worry – we have the all the experience required to not only assess the damage and structural stability of your property, but we also have an experienced team to carry out all of the restoration work. It is also important to organise emergency repairs quickly to ensure that your property is safe, secure and watertight whist your insurer reviews your claim. If there is significant damage that is affecting the structural safety of your property, we will liaise directly with your Local Authority Building Inspector to ensure we carry out the repairs in line with current building regulations. (This is another cost that insurers and Loss Adjusters can overlook. However, this is cost we will include in our quote if it is necessary). We have professional tradesmen able to carry out a diverse range of repairs. For more information on the building services we provide, please see our building services page.